My mother had cancer in both her breasts. 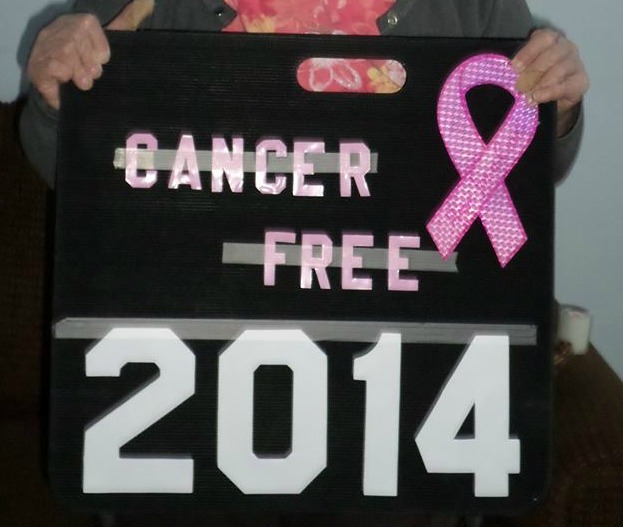 Her sister faced breast cancer. So did her other sister. My mother had both breasts and a dozen lymph nodes removed. My mother has been cancer free for a year and a half. My mother now deals with severe neuropathy. She takes six pills a day, is trying hair growth treatments, and has to wear a compression sleeve on the arm that has nearly doubled in size. Last year, she couldn’t feel the shoes fall off her feet when she was walking. Even with a bath before bed, her leg pain keeps her up at night, every night. Every six months, she faces scans and results, and her eyes grow wider with the breath-catching fears she is trying to suppress. Breast cancer continues to be a beast. The debate about pinkwashing is not new. Think Before You Pink is doing great work. People question how corporations can sell pink products with carcinogens, promising to donate a small percentage of the profits to the cure. People question the finances of the Susan G. Komen Foundation and its practice of suing small charities over the “For the Cure” copyright. Cause marketing may be highly questionable at times, but I can tell you for certain that October is the month my mother stands taller. The month of the year she rallies. It is a month of pride and energy for her. I am thankful for that. But that starts tomorrow. Today, you see, is the last day of September, a month dedicated to another community, children with cancer and their families. September is Childhood Cancer Awareness Month. The color is gold. Cancer has invaded my family strong. My mom and two aunts, dad, grandmother, great uncles, cousin, and others have faced that beast of cancer in one form or another. Yet, my devotion is to childhood cancer due to the severe lack of funding and research. Childhood cancers (4% of national research funding) are on the opposite side of the funding spectrum as breast cancer. To have their awareness months back-to-back is almost a shock in disparity. Cancer is not to be condensed to months or competition, but we should be wise in our awareness and in our understanding. We need to be knowledgeable about the details of treatments and side effects. All cancer patients deserve the hope found in funded research (at a more equitable level) and a month for rallying. Federal funding for childhood cancer research is predominantly allocated through the National Cancer Institute (NCI). Funds are distributed to Principle Investigators (scientists) working at labs which are often located at Children’s hospitals across the country (extramural research); to the Children’s Oncology Group to fund clinical trials (extramural research); and to labs within the NCI (intramural research.) Each year, Congress approves the amount of money that the National Institute of Health in Bethesda, Maryland will receive for research initiatives. Cancer will be funded in 2009 at a level of approximately $5.6 Billion. In 2007, the NCI reported that the combined extramural and intramural funding for childhood cancer research was approximately $180 million. However, this estimate could be regarded as liberal as some of the associated research might not be perceived as directly benefiting childhood cancer. Other more conservative estimates, put childhood cancer research funding as low as $30 million annually. To put this figure in perspective, the NCI allocated $572.4 million on breast cancer research in 2007. Other NIH Institutes funded breast cancer research at a level of $132.6 million in the same year; and the Department of Defense, which also supports breast cancer research, allocated an additional $138 million. As a comparison, breast cancer with its overall 5 year survival rate of close to 90% received $843 million in Federal research funding in 2007. This was in addition to the funds raised by breast cancer organizations through their pink ribbon campaigns and private donations. It is estimated that the success of those initiatives raises approximately $256 million in the combined assets of the top four breast cancer organizations. The success of the pink ribbon campaign and its resulting funding for breast cancer research has resulted in an increase in the five year survival rate of that patient population. Their strength as advocates has resulted in a strong position for both federal and private research funding. As individuals and organizations supporting our nation’s children and adolescents with cancer we too can take a strong stance for our cause with both federal and private research funding. Breast cancer is the sixth most common cause of death by disease of women in America (behind heart disease, stroke, lung cancer, respiratory disease and Alzheimer’s). In comparison, cancer is the number one cause of death by disease of America’s children. In terms of person years life lost (PYLL), the average age at diagnosis of breast cancer is 61, with a calculated 16 PYLL. In contrast, the average age that a child is diagnosed with cancer is 10. This calculates to 67 PYLL. Sixty seven years of life lost when a child dies from cancer. Our call to action is to increase the awareness of the incidence and devastation of this disease on America’s children. By raising awareness of the fact that childhood cancer remains the number one disease killer of America’s children, we can raise the awareness of the need for greater research funding. Like breast cancer, childhood cancer has an international symbol “the gold ribbon. The gold ribbon was created by parents of children with cancer and former CCCF board member Gigi Thorsen. Its first production as a lapel pin was funded by CCCF in 1997. Working together, we too can become successful cancer advocates through the promotion of the gold ribbon for childhood cancer, so that we too can build research funding and much needed cures for America’s littlest cancer patients. It’s Almost 9/11. The Liberal of the Family is Reaching Out. THANK YOU from an angel mom. Our Jake is FOREVER 6.